Samurais and the Old West: can the combo ever not satisfy? Bernie Madoff was a piker. He stole a few score billion dollars. But how much is a whole state worth? All the land, natural resources, and structures? That's what James Addison Reavis stole--almost getting away with the theft too. 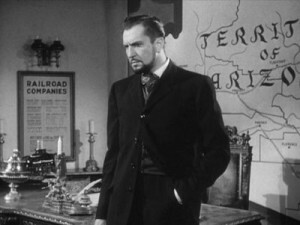 Last night I watched THE BARON OF ARIZONA, a 1950 film by Samuel Fuller and starring Vincent Price. It tells the true story of Reavis, who cooked up an incredible con job to lay claim to the entire territory of Arizona in the year 1883. You can read a fascinating essay about it here. This is one film definitely worth renting for those with a taste for weird history.